I recently was debugging a problem in MPICH2 with the new MPI-3 nonblocking collectives implementation that involved a stack overflow. The code in question was usually blowing up with a SIGABRT that came from a stack trace ending in __stack_chk_fail. This bug was particularly nasty because it was a Heisenbug: it kept changing the failure location and mode whenever I would insert debugging code in order to track it down (hence the aforementioned “usually”). For reasons I will explain later, my usual trick for this sort of thing did not help. Adding in those macros would cause the bug to vanish, or to reappear in a different function that had not been instrumented with MPIU_SG_ macros. Luckily, I ran across this very helpful blog post that eventually helped me track down the real problem. My basic approach was the same as the one outlined there, but it needed modification due to the pain inherent in debugging a parallel MPI application. This particular bug required running at least 4 processes in order to manifest itself, and it would only appear after several iterations within the test program. 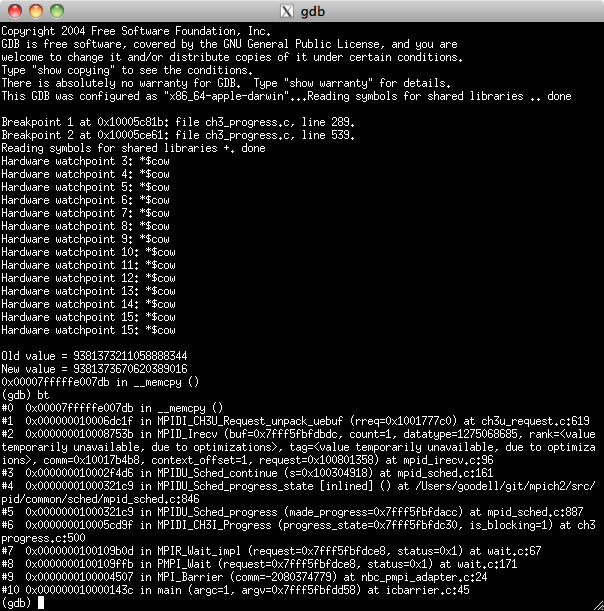 So I used mpiexec + xterm + gdb + a gdb script file to handle the job. This function is called, adding operations to a communication schedule, then an MPI_Wait call is made later to actually force the bulk of the schedule to complete. Take a closer look at the buffer used for the intercomm broadcast. It’s a stack allocated variable, which worked great in the blocking version of this routine. Unfortunately, this is a nonblocking barrier, so this routine exits before the ibcast is actually ever performed. So now we’ve managed to schedule a broadcast to occur that will overwrite a location on the stack that no longer actually refers to int buf;. Instead, if we are unlucky it will refer to some random piece of a different function’s stack frame. In the backtraces above, this random piece was the -fstack-protector/SSP canary memory. The bug moved around when I would insert debugging variables because they would affect the specific location of the canary value in memory, sometimes yielding a corrupted parameter or local variable instead. Changing that buffer to be malloced instead fixed the problem. Content by Dave Goodell, all rights reserved. Powered by the Pixyll theme for Jekyll.